"Enthusiasm is the most important thing in life." 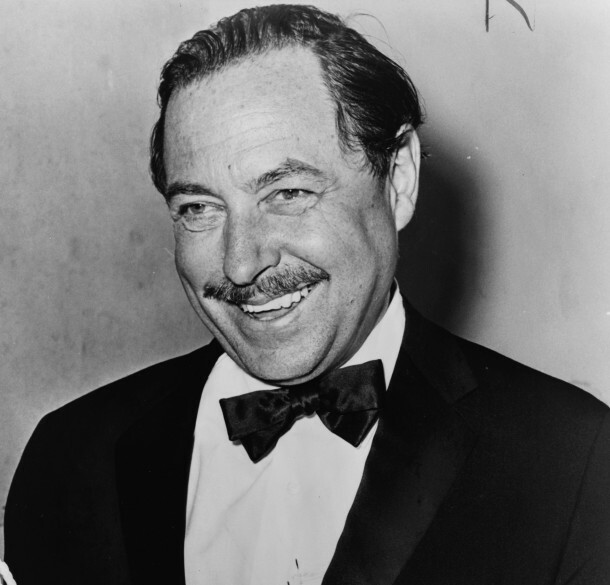 Tennessee Williams at age 54 in 1965. Photo by Orland Fernandez. He was brilliant and prolific, breathing life and passion into such memorable characters as Blanche DuBois and Stanley Kowalski in his critically acclaimed A STREETCAR NAMED DESIRE. And like them, he was troubled and self-destructive, an abuser of alcohol and drugs. He was awarded four Drama Critic Circle Awards, two Pulitzer Prizes and the Presidential Medal of Freedom. 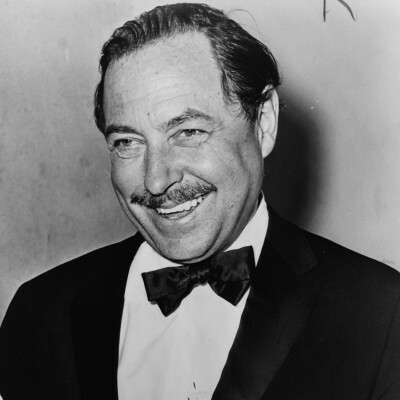 He was derided by critics and blacklisted by Roman Catholic Cardinal Spellman, who condemned one of his scripts as “revolting, deplorable, morally repellent, offensive to Christian standards of decency.” He was Tennessee Williams, one of the greatest playwrights in American history. Born Thomas Lanier Williams in Columbus, Mississippi in 1911, Tennessee was the son of a shoe company executive and a Southern belle. Williams described his childhood in Mississippi as happy and carefree. This sense of belonging and comfort were lost, however, when his family moved to the urban environment of St. Louis, Missouri. It was there he began to look inward, and to write— “because I found life unsatisfactory.” Williams’ early adult years were occupied with attending college at three different universities, a brief stint working at his father’s shoe company, and a move to New Orleans, which began a lifelong love of the city and set the locale for A STREETCAR NAMED DESIRE. Williams spent a number of years traveling throughout the country and trying to write. His first critical acclaim came in 1944 when THE GLASS MENAGERIE opened in Chicago and went to Broadway. It won a the New York Drama Critics’ Circle Award and, as a film, the New York Film Critics’ Circle Award. At the height of his career in the late 1940s and 1950s, Williams worked with the premier artists of the time, most notably Elia Kazan, the director for stage and screen productions of A STREETCAR NAMED DESIRE, and the stage productions of CAMINO REAL, CAT ON A HOT TIN ROOF, and SWEET BIRD OF YOUTH. Kazan also directed Williams’ film BABY DOLL. Like many of his works, BABY DOLL was simultaneously praised and denounced for addressing raw subject matter in a straightforward realistic way. The 1960s were perhaps the most difficult years for Williams, as he experienced some of his harshest treatment from the press. In 1961 he wrote THE NIGHT OF THE IGUANA, and in 1963, THE MILK TRAIN DOESN’T STOP HERE ANY MORE. His plays, which had long received criticism for openly addressing taboo topics, were finding more and more detractors. Around this time, Williams’ longtime companion, Frank Merlo, died of cancer. Williams began to depend more and more on alcohol and drugs and though he continued to write, completing a book of short stories and another play, he was in a downward spiral. In 1969 he was hospitalized by his brother. After his release from the hospital in the 1970s, Williams wrote plays, a memoir, poems, short stories and a novel. In 1975 he published MEMOIRS, which detailed his life and discussed his addiction to drugs and alcohol, as well as his homosexuality. In 1980 Williams wrote CLOTHES FOR A SUMMER HOTEL, based on the lives of Zelda and F. Scott Fitzgerald. Only three years later, Tennessee Williams died in a New York City hotel filled with half-finished bottles of wine and pills. It was in this desperation, which Williams had so closely known and so honestly written about, that we can find a great man and an important body of work. His genius was in his honesty and in the perseverance to tell his stories.